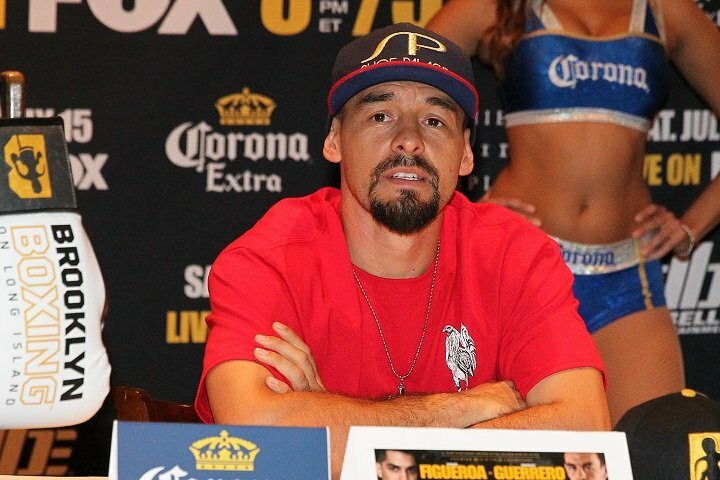 Guerrero-Figueroa final press conference quotes for Sat. Former world champions Omar Figueroa and Robert Guerrero went face-to-face Wednesday at the final press conference before Saturday’s Premier Boxing Champions on FOX and FOX Deportes tripleheader taking place at the newly-renovated NYCB LIVE, home of the Nassau Veterans Memorial Coliseum. Also in attendance Wednesday and competing in televised action beginning at 8 p.m. ET/5 p.m. PT were unbeaten light heavyweights Marcus Browne and Seanie Monaghan plus Polish heavyweights Artur Szpilka and Adam Kownacki. Tickets for the live event, which is promoted by DiBella Entertainment, start at $50 (not including applicable fees) and are on sale now. Tickets can be purchased online by visiting www.ticketmaster.com, www.nycblive.com, or by calling 1-800-745-3000. Tickets are also available at the Ticketmaster Box Office at NYCB LIVE. Group discounts are available by calling 516-231-4848. Additional action on Saturday begins on FS1 and FOX Deportes at 10 p.m. ET/7 p.m. PT and will feature a welterweight matchup between Jamal James and Jo Jo Dan, plus unbeaten prospect Brandon Figueroa, brother of Omar Figueroa, who was in attendance Wednesday and will face Eliezer Aquino. “We know that Guerrero is a tough guy and it’s going to be a rough fight. We prepared really well to go 12-rounds and get the win. “I love having my brother Brandon in camp and on this card with me. It gives me an opportunity to take my mind off of my fight and focus on Brandon for a bit. It really helps me cope with everything leading up to a big fight. “Training camp was amazing. We did a lot of sparring with lefties so that my footwork is down. Other than that I was just grinding every day and trying to get better. “I’m really happy to have the team that I have. Joel Diaz and I work really well together because we have the same mentality, but he can tell me when I need to take a step back. “New York is one of the places that has held historic fights. Being on that same stage as great fighters from the past is amazing. It’s one of those things that makes you feel like you made it. “I know how hard Robert Guerrero has worked to get to this point in his career. I want to prove that I can be in the big fights that Guerrero has already had. I’ve had a long time off but I can’t wait to get it on Saturday night. “I’m expecting Omar to come to fight. He’s undefeated with a great record so if it’s not broken, I don’t expect him to change his style. “You have to prepare for everything for a guy as awkward as Omar. I’m going to have to make adjustments in the ring. If I can stay focused I know I can get the victory. “I’ve made a lot of improvements since the last time people saw me. There’s way too much talent in this division for me to just come forward and press. I’m in great shape and I’m ready to work behind my jab do everything I need to do to be successful in the ring. “I’m blessed to be here and have this tremendous opportunity in the main event again on FOX and FOX Deportes. It’s been a while since I’ve been in the ring but I never stopped working in the gym. “I’ve said before that I had to go to the drawing board but this time we erased everything and rewrote it. This layoff has really helped me get in great shape and I’m really excited to get in the ring. I’m ready to turn the page to the next chapter of my career and that starts with this fight. “I’m ready to roll. I’m ready let my hands go and get in the ring and rumble on Saturday night. This is going to be a great night of fights. “This is a big fight for me. It’s a great fight against a very determined and experienced fighter. Seanie is a veteran in this sport but he’s still hungry. He has a lot to lose, as do I. We’re both going to put it on the line. “I’m excited to be part of opening up this new venue. There are a lot of different cultures that come together in Long Island and it should make for a great crowd. “I think the timing that my career has progressed has been great. I’ve been going step-by-step and I feel like I’m on a good path towards a world title. “Training camp has been excellent. I’ve been sparring a lot of lefties and getting ready for this style matchup. This is probably the longest camp I’ve ever had and I feel great. I’m on weight right now and ready for this fight. This is the best shape I’ve ever been in. “It’s very inspiring to be looking at the place that you’ll be fighting while you’re training. I do my hardest workout on the track right across the street from the Coliseum. It helps me dig deep while I’m suffering. “This is going to be an interesting matchup. Marcus and I are pretty much opposites in the ring. I’m a righty and he’s a lefty. He’s a fast-starter and I’m a strong finisher. It’s my job to turn it into a battle of wills. “I’m fully-charged physically and locked and loaded mentally heading into Saturday night. This is the caliber of opponent I’ve been looking to face for a while and I’ll be ready when the bell rings. “I want to show that my loss was an accident and that I’m ready to put on a great show for the fans. “We will see how hard this fight will be. That is up to him, because I will be ready to put it all on the line and get this win. People want to see emotions in the ring and we will see if Kownacki is ready for me. “I have to take this fight very seriously. I am in the best shape of my career. I can’t take for granted that I’m going to go in there and knock him out immediately. “I waited a long time for this return. I broke my hand after the Deontay Wilder fight but now I am back and 100 percent ready for this fight. “This is a big stage and a great challenge for me. Now it’s time for me to show that I’m ready for this. I’ve never ducked a challenge and I never will. “All the hard work is done. I feel great after a really strong training camp and now the fun part comes Saturday night. “I sparred with (top U.S. amateur) Cam Awesome, who is a good mover around the ring so he’s definitely helped prepare me for what Artur is going to bring. “It means a lot to be in a fight between two Polish heavyweights. We’re two of the best Polish heavyweights in the world and only one of us can wear the crown. “This is my coming out party. I’m going to make a statement on Saturday. I’ve been patiently waiting for this chance and now I’m going to prove that I belong. “I feel like I’ve improved a lot during this training camp. I feel very strong and confident heading into this fight. It’s really exciting to be on a card like this with my brother headlining. “I’m just going to take my career step-by-step and take it one fight at a time. Hopefully if I keep working hard and performing I can get a title shot. I just want to take every fight that I can so that I can perform in front of the fans and give them a great show. “I feel very prepared and very confident heading into this fight. This is definitely one of the best camps I’ve had. I fight a lot of heavy guys in Joel Diaz’s gym and it helped me get perfectly prepared for this fight. “On Saturday big-time boxing returns to Long Island. It’s been 31 years since a big boxing show on Long Island and that show was headlined by Mike Tyson. Saturday night is going to be a great night for boxing in the New York area. “This show has three terrific fights coming to us on Saturday night. I love that this card has three fights where the outcome is up in the air and they’re all-action matchups. “Artur and Adam are in something of a grudge match, with these two Polish heavyweights talking about this for over a year, and now it’s finally going to happen. This is an important heavyweight fight. The loser takes a big step back. “Marcus Browne is a young lion rising his way up the ranks at light heavyweight. Seanie has been waiting a long time for an opportunity like this. The winner of this fight is right there for a world title. These guys have been friendly in the past, but they won’t be friends on Saturday night. “The main event is definitely a crossroads fight to some extent. I have tremendous respect for both Omar and Robert. Omar is returning to the ring against one of the most experienced and battle-tested fighters out there in Guerrero. You are here: Home / Boxing News / Guerrero-Figueroa final press conference quotes for Sat.